Daryl Richey moved to Dayton when he was 21 to start a new life. "I grew up in Columbus in a pretty bad neighborhood," says Daryl. "Growing up there made me who I am. And it also made me want to do something where I could affect other people's lives positively." 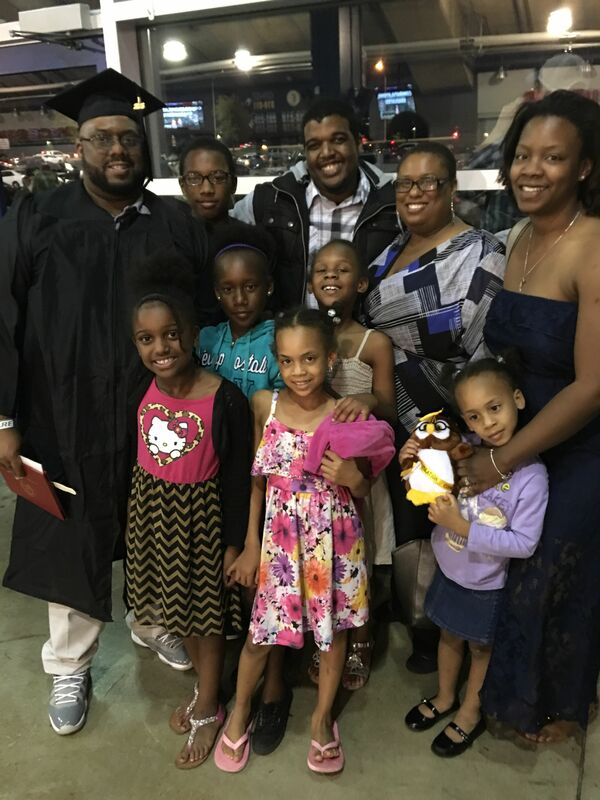 Daryl started classes at Sinclair College in 2005 and was admitted to the Occupational Therapy Assistant program after completing his general education requirements. Shortly after starting classes, Daryl had to leave the program. "I was working while going to school, I had just gotten married, and then my first daughter was born. I wasn’t able to maintain the hours of the program while working and caring for a newborn," says Daryl. "The program director at that time told me if I ever wanted to come back and finish my degree to let her know." In the coming years, Daryl and his wife had three more daughters. He worked at the same company for almost a decade to support his growing family. "I got laid off from a job I had for nine years and at that time I had the opportunity to go back to school or retrain in a different career field," says Daryl. "I still had a passion for occupational therapy so I came back to Sinclair to talk to the program director. She was about to retire and she told me she believed in me and would reinstate my status as a student, but that it would be one of her last acts and that I needed to make it count." Daryl was inspired to graduate with his occupational therapy assistant degree and reenrolled in the program in the fall of 2014. After beginning the program again, Daryl experienced several hardships in his personal life. "My grandmother passed away, my father had a near fatal health incident, and my mother-in-law passed from breast cancer," says Daryl. "My wife and I were raising four girls and dealing with losses in our family and once I even broke down outside of class in the hallway. It was a rough road but the instructors helped me and I stayed focused." The faculty and staff continued to believe in Daryl and encouraged him to keep pursuing his degree. "I was really struggling with one of the classes I was taking and the program director came up to me and said, 'Daryl, I really want you to succeed but I have to be honest, I'm concerned about you making it through this semester. I know you have those beautiful girls at home, do you have a plan B?'" recalls Daryl. "I told her occupational therapy had always been my Plan A and that I was trying to leave my Plan B. Her concern motivated me to study harder and push to become the professional I am today." With persistence and determination Daryl completed his classwork, excelled in his clinical work, and graduated from the occupational therapy assistant program in the Spring of 2016. "Throughout the whole process the faculty and staff encouraged me and helped me to recognize what a gift it was to pursue my passion," says Daryl. Daryl had multiple job offers prior to graduating. "In one of my first interviews the hiring manager told me they had been looking for a Sinclair graduate because they had heard so many great things about us. I think the addition of the new Health Sciences Center will continue to make Sinclair graduates desirable job candidates," says Daryl. "I work with nurses as well as reparatory, physical, and speech therapists everyday—having the collaborative learning space at the Health Sciences Center will introduce students to what the work environment is like before they even start their clinical rotations." Daryl works for Symbria Rehab and PRN for Springfield Memorial Regional Hospital where he completed his Level II clinical rotation. He enjoys the positive impact he is making in other people's lives. "Occupational therapy allows me to help people when they're vulnerable and recovering," says Daryl. "I wouldn't be where I am if my wife, teachers, and classmates didn't believe in me. Now I get to encourage people to believe in themselves. With my education from Sinclair and therapeutic use of self, I can competently guide patients through the occupational therapy therapeutic process to insure a positive outcome so they can move on to lead productive lives."